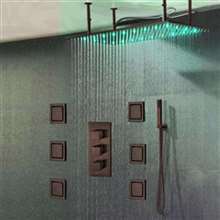 The Fontana Rivera Shower Set in Copper Finish is available in 8", 10", 12" and 16" sizes. Stainless steel materials, copper finish and brass copper finish shower diverter. Rain shower head feature provides a unique bathing experience. Durable, dependable and with the luxury of a copper finish solid brass rough-in valve. Shower head size: 8"; 10"; 12", 16". Easy installation. All standard accessories are included. Good thing I caught this one while it's on sale. I've been wanting to get this for a while but then I thought that the price was too high, so I neglected buying this at first. But now that it's on sale, there's no more reason for me not to buy this. I find the LED lights quite remarkable, though not as bright as I would've wanted them to be. Still, they're kind of pretty and they're all working, not like the LED shower head in one of the hotels I stayed in before where some of the LED light bulbs seems to have been busted. Hopefully this one won't go the same way soon. The copper finish looks very good, the shower head is made of brass, not cheap plastic. For the price I got it on sale I would say it was a real bargain. Works good, nice strong water jet. Since it got 5 years warranty there is not much to be concerned about. They have good products on this site. So it was the LED lights that made me want to buy this thing. After all, this is the first time I'll ever own one, so I decided to give this a try. It looked ok, and the price seemed reasonable so what's stopping me from getting it, right? Well, I am very happy with it. I like how it looks and its finish, and the LED lights are just plain awesome. I would definitely recommend this one. We saw a lot of really impressive products here in the site, but for now, we really just need a shower head, and so when we saw this, we decided that this is perfect for our needs. It looked great, and after several days now we hadn't had any problem with it. We're actually really pleased with this one - in fact, we're thinking about buying some shower jets as well to go with this one.